Bolivia is super safe and super awesome. It’s in my top 3 all-time favorite country’s list. 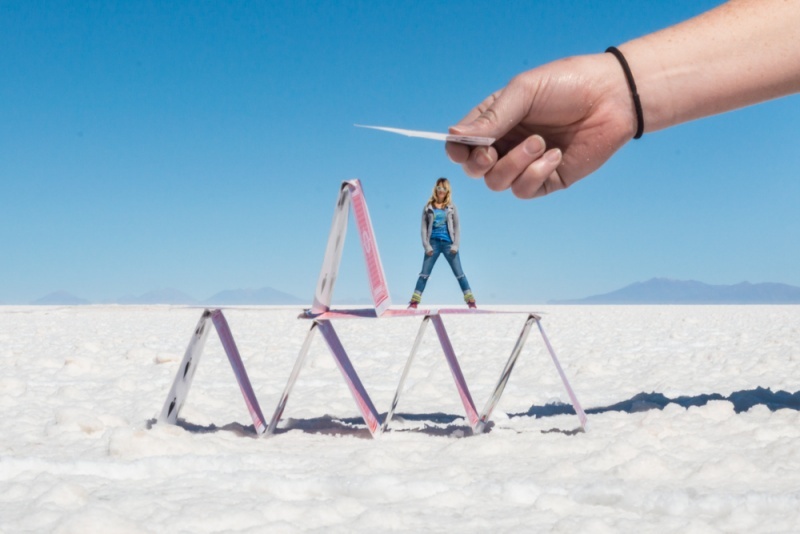 US citizens are required to pay a “reciprocity” fee to enter Bolivia. At the time we visited it was $135/person and they required that you have crisp, new bills. “New” meaning that they were printed after 2004 and “crisp” meaning that they had no tears, folds, or markings on them. As visa costs and “reciprocity fees” change regularly you should check for up-to-date information on all South American visas. 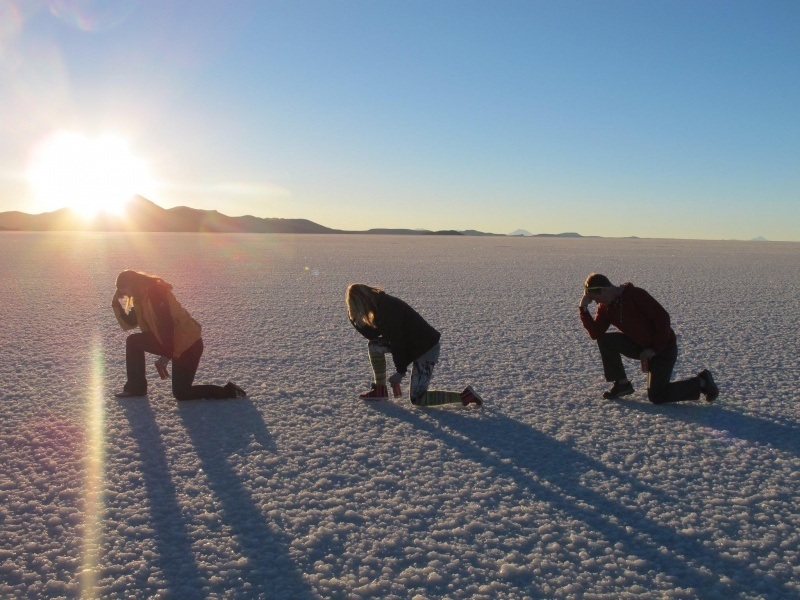 After a long, and uncomfortably bumpy night bus from La Paz, we arrived in Uyuni bright and early. 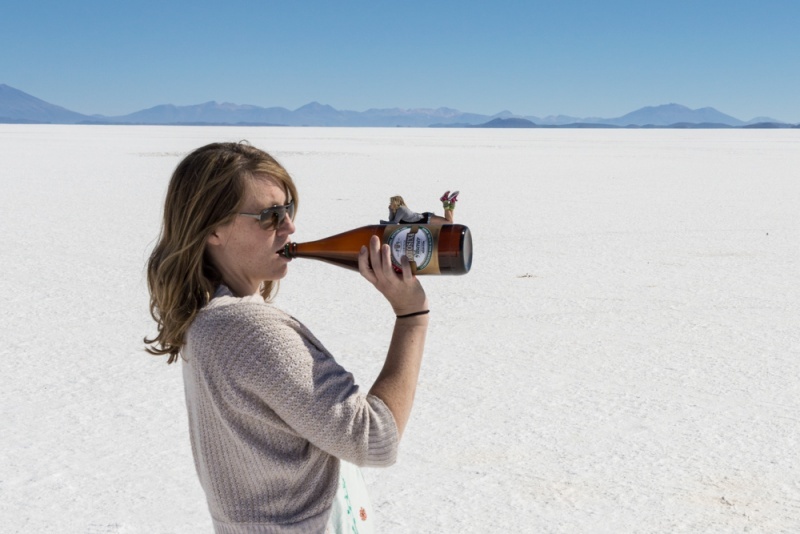 We set out to find a two-day tour of the Salt Flats; we only had two days because Courtney was on a tight time schedule but most tours are offered as either one day or three days. The two-day “official” tour included an overnight stay in a salt hotel which was appealing but most of the second day would be spent hiking a volcano. I was not amused by the thought of hiking up another volcano, especially since my weary body has yet to heal from the Inca Trail. So we decided to hire a driver and create our own custom tour. 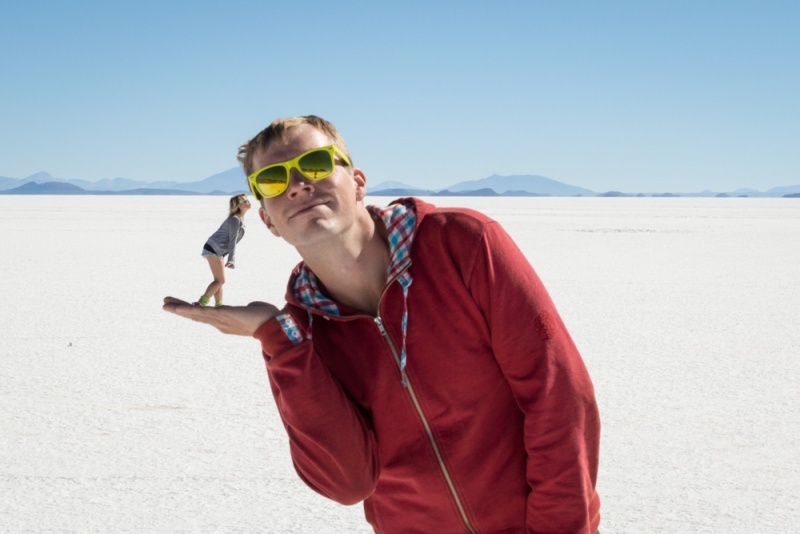 This turned out to be a great way to do the tour… we got to see the things we wanted, skip the things we didn’t, and take copious amounts of mini-me depth photos. Perfection! 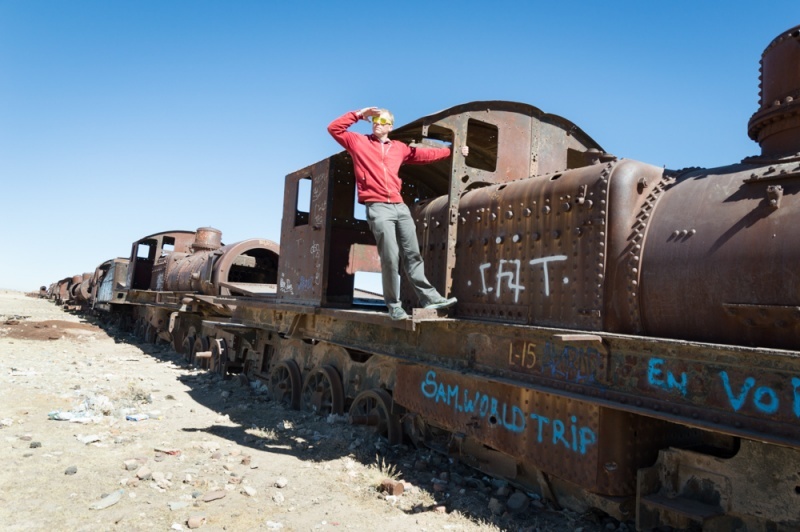 Day one started with a trip to the railway graveyard which has abandoned tracks and an abandoned train. Then on to the salt mountains and the original salt hotel (that even has salt toilets!). We also got to see the giant cactus island and the volcano (from the bottom of course). Along the way we stopped countless times to take depth perception photos; our guide, Juan Carlos, was less than amused. We caught an epic sunset and then settled into our salt hotel. The walls, floors, bed frames, tables and chairs were all made of salt (of course we licked them just to be sure). Nick and I shared a room with three beds which was great because each bed had three blankets and I piled all nine onto one tiny bed that we ended up sharing. Why you ask? Salt must not be the greatest insulator and it was FREEZING. We had a nice dinner that was prepared by the owners of the hotel, caught an amazing moon rising, and headed to bed. The next day was more of the same… photos, photos and more photos. 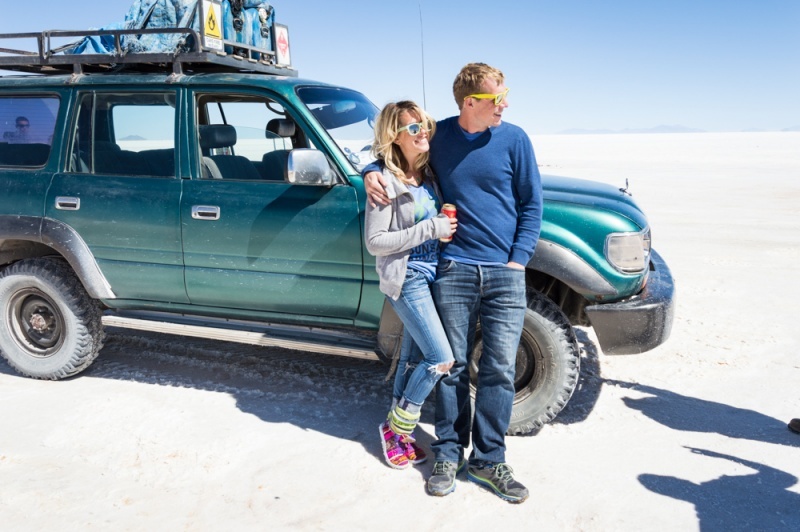 We had a good time driving around the flats and drinking cervezas. Then it was back to Uyuni, and on another miserable night bus back to La Paz. Great tour, great fun, sad we didn’t have more time. 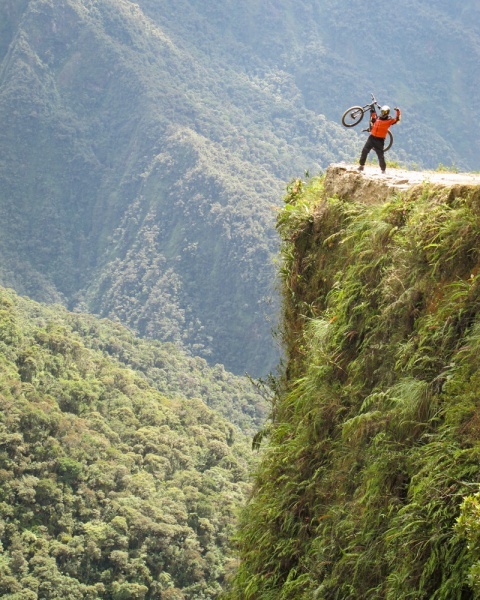 North Yungus Road aka the “Death Road” aka “World’s Most Dangerous Road” was built in the 1930’s by Paraguayan prisoners. It is estimated that 200-300 people are killed yearly along the road and at least 18 cyclists have died since 1998. Not to mention all of the injuries by cyclists going over their handlebars. And of course the emotional scars (okay, maybe that’s just me…). I had been dreading the Death Road for weeks leading up to this event. 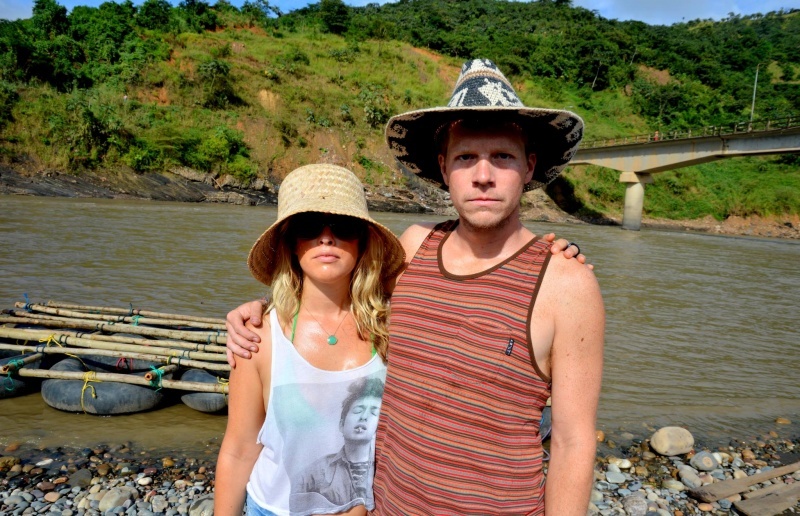 We had encountered countless people along our journey who loved Bolivia. 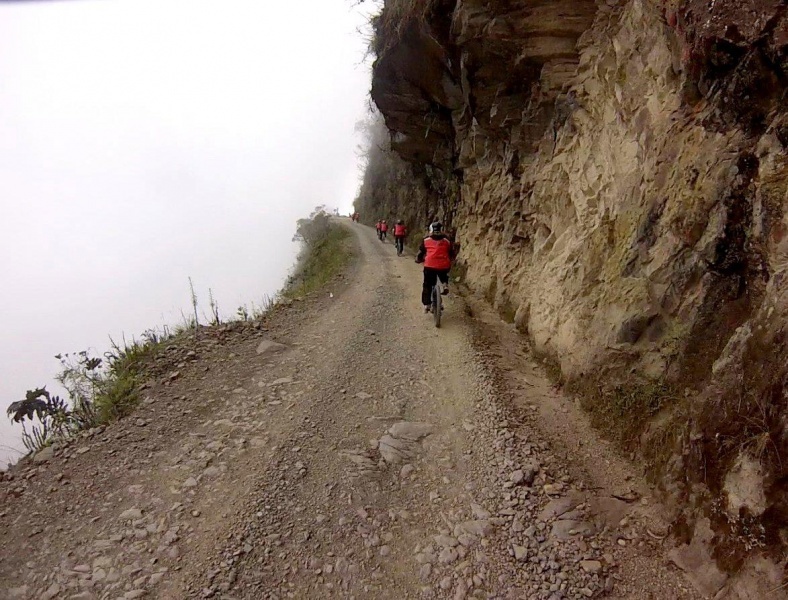 And most thought that the Dead Road bike ride was a highlight of any adventure seeker’s Bolivia itinerary… so Nick immediately added it to his bucket list. 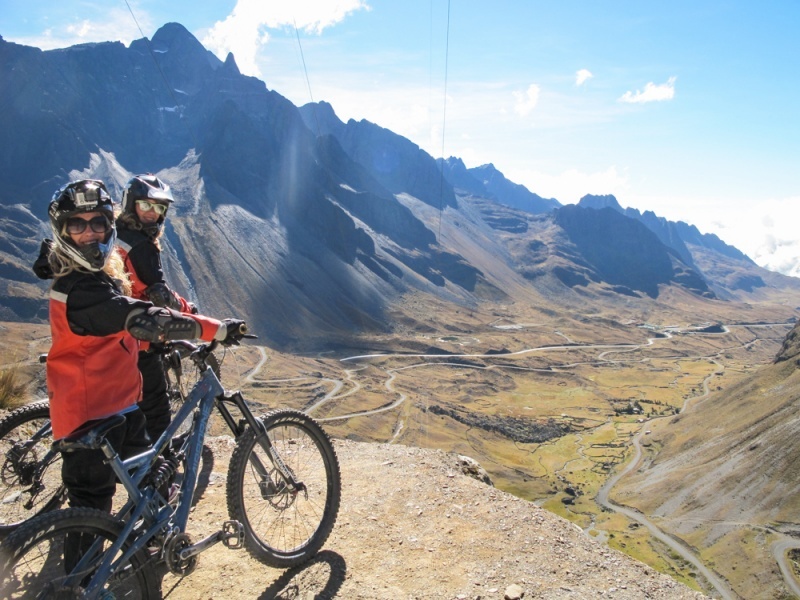 Being less than skilled at biking in general, especially mountain biking, this tour sounded like my worst nightmare. But as with most of the horrifying things I try, I knew I would regret not doing it. We chose Vertigo for our tour and they picked us up bright and early at 8am. We had an hour or so bus ride and then arrived at our launch spot. We got suited up with appropriate biking gear… knee pads, elbow pads, rain pants, rain jacket, and helmet. And we were off. The initial portion of the road was improved in later years and there is a split between the new road and the Death Road. So the ride started out smooth and paved for several miles. I was in the back, as anticipated, but was having fun nonetheless. Then came the pain. Once the road splits, it is no longer paved and the road becomes narrow and rocky. Oh, and with a steep drop-off on one side. Like 15,000 feet drop-off steep. We started off and again, I was happy to hold-up the back (you know, to make sure everyone was accounted for). It was slow and steady wins the race for me. Nick and Courtney were a bit faster and seemed to be enjoying themselves. We had a few stops for pics but our group was fast (professional mountain bikers?) and the guide kept us at a quick pace. I was fine for a bit; attempting to avoid large rocks and to look over the edge. But one misstep, a slight skid near the edge, turned me into a nervous wreck. Unfortunately for Nick and Courtney this was where I was officially “over it” and ready for the tour to be over. Unfortunately for me, I still had a long way to go. After some bitching/crying/whining, I finally convinced Nick and Courtney to stick with me for the remainder of the ride stating that I wanted someone to bare witness (and feel endless guilt) in case I went careening over the edge. We finally finished around 3pm and boarded the bus for a local hotel where we had beers, a buffet, and pool time. It was the perfect way to end a most imperfect tour. We had maybe a few too many beers at the pool and on the 3-hour bus ride back; after a particularly obnoxious Val and Court karaoke sesh, the one other passenger in our van made the wise decision to move to the second van (even though it was already full). We arrived safe and sound in La Paz around 9pm at which point we drank more beers, ate street food, and had a “happy to be alive” dance party. 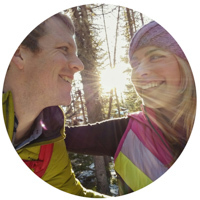 From the moment I took that ridiculously bumpy ride into La Paz, I knew it was love at first sight. The city was a madhouse full of bad drivers, endless street markets, and zebras directing traffic? Turns out the zebras are a part of a program for 3,000 high-risk youths that gives 15-22 year old’s part-time jobs helping elderly or disabled patrons cross the street. They work four hours daily and receive 400 Bolivianos ($57 US) per month AND get health insurance. Awwww… I love this story! When we first arrived in La Paz we made a point to visit the Witch’s Market where they well llama fetuses which are good luck if you bury them under newly constructed buildings (horrifying). We also went to a local dance club where a girl named Yolanda taught us a few Bolivian dance moves (mainly one hair flip), then arrived back to our 8-person dorm room at the Adventure Brew Hostel at 4:00am where I’m sure I woke everyone up by trying to hoard the toothpaste and making Courtney help me out of my jeans. Before that night I pretty much refused to stay in hostel dorms because there is always one obnoxious drunk person being loud and waking everyone up. Apparently that person is me. We also took Courtney on a sweet street food tour… mucho deliciouso. Most of the street food vendors in La Paz have a prime spot along the street and serve their food on regular plates (no to-go here…) so you must sit with them on the street to enjoy the feast. And we ate like kings for less than $3 each. May 2nd was a sad sad day, we had to send Courtney back to her big-girl job in the states. We sent her back with a few key items to make our travels a bit easier… my very large and in-charge suitcase went back to Tennessee and in it’s place a much smaller hippie, hand-crafted duffel bag that cost me $11; also a few shirts that had gone unworn and a some souvenirs that were impossible to resist. Our super-sad-Courtney-is-leaving-party was an epic dance party at a Bolivian gay bar. In reality it was a Val-and-her-new-gay-best-friends-conga-line-party while Nick and Courtney looked exhausted and ready to go to sleep in the corner. 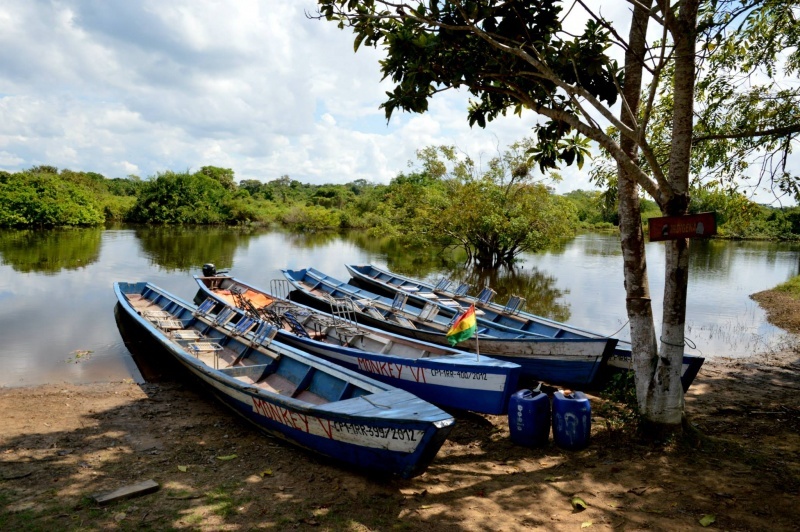 When Nick and I were discussing making a trip to the Bolivian Amazon, we had a few options to get there; we could take a 30-minute flight, or a 22-hour bus ride, or a 3-day boat trip, or a 5-day rafting trip. Of course we had to go for the rafting trip… why arrive in only 30 minutes when you can take 5 days instead? Turns out this trip is really quite authentic and only offered by one company; Deep Rainforest. Unfortunately they need at least 4 people confirmed in order to make the trip and so we signed up anyway and hoped for others to jump on board. Luckily they did and there ended up being 7 of us total along with 2 local guides, an English speaking guide, and a cook. 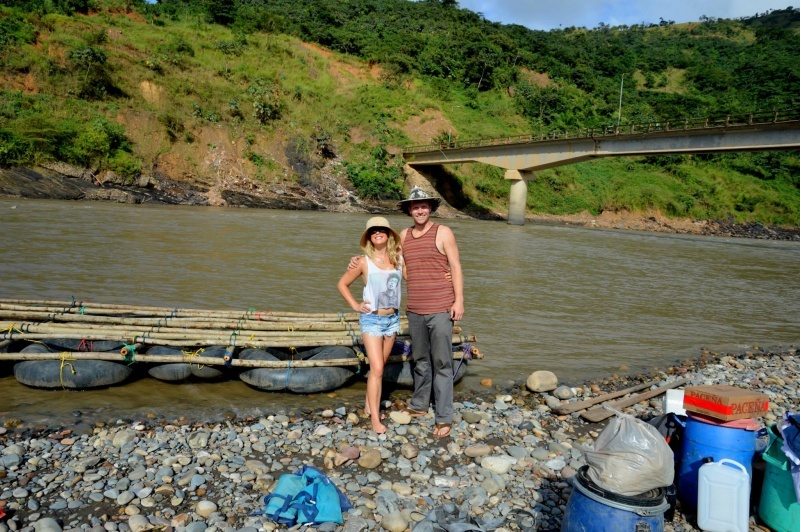 The trip to the raft launch location took a part of the new Death Road and we made the trip by taxi. 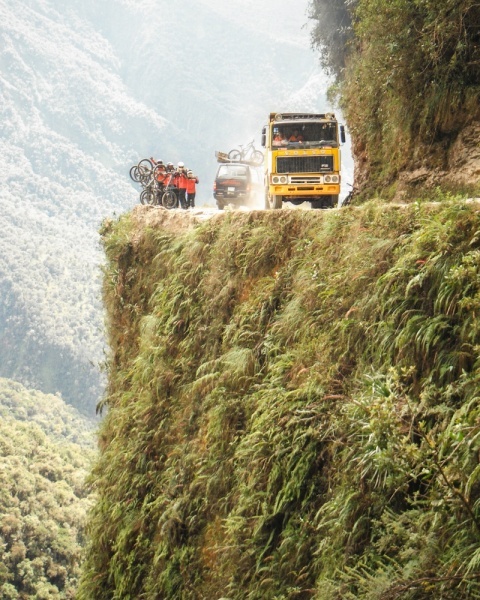 I for one was horrified… the road was narrow, the drop-offs massive, and the amount of dust at times made it impossible to see. The trip was long and sadly for our taxi driver, right at the end of our journey his car broke down and we were forced to leave him in the middle of the street trying to fix it. The first night we had the option to stay in a hostel or to camp and we chose camping of course. We got a chance to meet our guides and watch them build our raft. 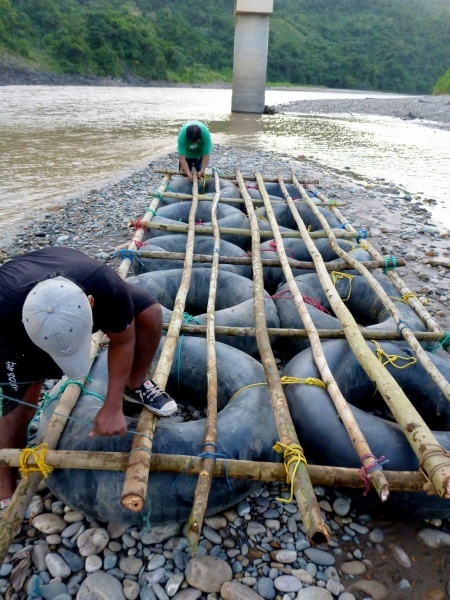 The raft was composed of 10 large inner tubes and a few bamboo logs all tied together with rope. It was rustic to say the least. They had us put all of our things in plastic bags and they were then used as our seats for the duration of the float. Day 2 was spent floating for a bit and then stopping for a jungle walk and a great reward of a waterfall and amazing swimming hole at the end. We had a dip and learned a bit about plants and trees along the way. Because we were running behind schedule we did not make it to the campsite the second day and were forced to stay in a hostel in a small town. I say “forced” because camping would have been a more enjoyable and hygienic option. The bathrooms were very unsettling and when I attempting to take a shower I found it impossible to get clean. 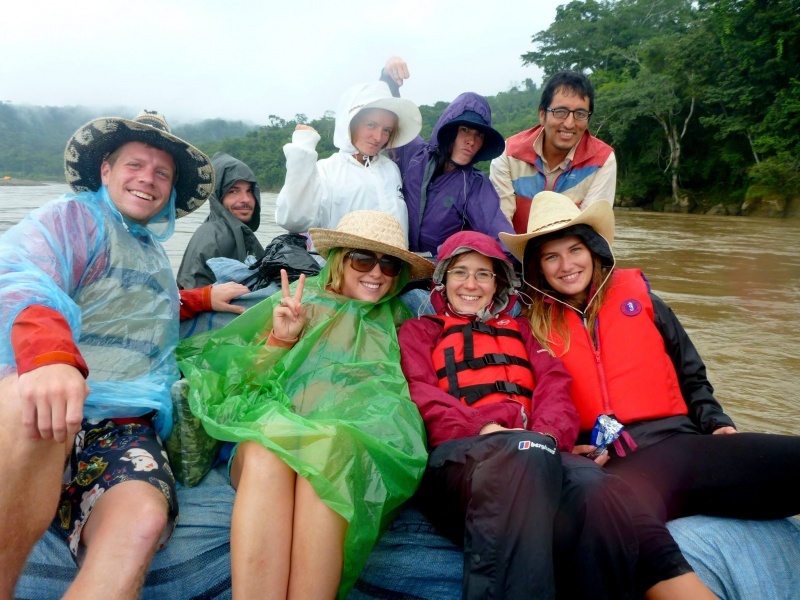 The next several days were spent floating with occasional swim breaks in the murky brown water, taking jungle walks, eating local fruits, and enjoying the company of our awesome group and guides. No rafting trip would be complete without booze so, of course, we had plenty of beers for the journey which made things a bit more interesting. On day 3 we took a night jungle walk with our headlamps where we saw several snakes and some incredibly large spiders and we got to Tarzan swing over a large swamp puddle along our trail. On the last day we were running really late and were able to negotiate a ride with a local in a motor boat for 100 BOBS (about $14 US). We kicked back, enjoyed the stars, and arrived to Rurrenabaque around 8pm. Then we all met up at the local watering hole to swap info and enjoy some cocktails. Overall the trip was fantastic, fun, and relaxing. I was perfectly happy being filthy dirty, sleeping on the ground and taking uncomfortable jungle poos. The only downfall? The bugs. Oh the bugs. 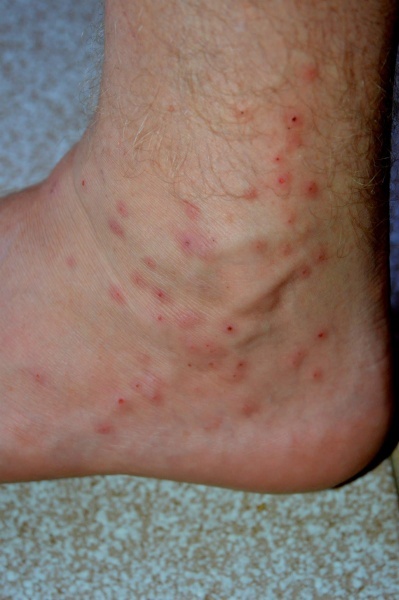 Between mosquitoes (or “mozzies” as the Brit’s call them) and the sand flies, we were covered in bites from head to toe. It was also a bit unnerving to know that in case of any type of emergency we were at least 2 days travel from any sort of town, but that just added to the excitement I suppose. It was truly a trip of a lifetime! After our 5-day rafting trip we took a day to rest in hammocks in Rurrenabaque; a very quaint town that we liked immediately – it should definitely be one of the places you visit in South America. We met up with two lovely new friends from our jungle rafting trip, Gemma and Ricard (Gemma was renamed Wolf because she liked the nickname and Ricard was renamed any name that started with an “R” because I couldn’t for the life of me remember his actual name) and decided to all do a Pampas tour together. The tour started with a long, bumpy, dusty ride in a Jeep to the boat launch area. There were 8 of us total… the “Funky Foursome” and two other couples (that seemed to be very shy and/or scared of us) and our non-English-speaking guide who we called Senior Tarzan (not really sure what his real name was). We all boarded a long, canoe-shaped boat with makeshift chairs and set off for a 2-hour long ride to the camp. Along the way we saw loads of birds, alligators, turtles, and even some monkeys that apparently sit on your head if you hold a banana over it… this was by far my favorite part of the trip. We arrived to camp which was a few simple cabana dorms, all built up high off the ground to keep the wildlife out. The other couples in our group opted for private rooms so the “Funky Foursome” got an entire 8-bed dorm all to ourselves. Good thing because at nights we liked to crowd under one mosquito net and make up rap songs (“all my gators love me, all my, all my gators love me”). The first night at camp we took a ride out to a nice spot to catch sunset. We were excited to run into the rest of our original jungle rafting trip peeps and have a fun game of football. Almost immediately after the sun set we were bombarded by the most angry and hateful mosquitoes anyone has ever encountered. They were “literally mental” and bit me right through my stretchy pants… no bueno. Later that night we all got our headlamps and took a night boat ride to find gators. They are easy to spot with a good lamp because their eyes glow. Creeps. We saw a bunch and our guide loved to get us up really close to them. Wolf and I ended up on each others laps during those horrifying moments. Day two we were awoken by an extremely loud howler monkey and then suited up in knee-high rain boots and headed into the swamp to find anacondas. The mud was thick and deep and I immediately fell in and had a wet, dirty bum for the remainder of the trek. Turns out the anacondas didn’t want to be seen but the mosquitoes sure did. 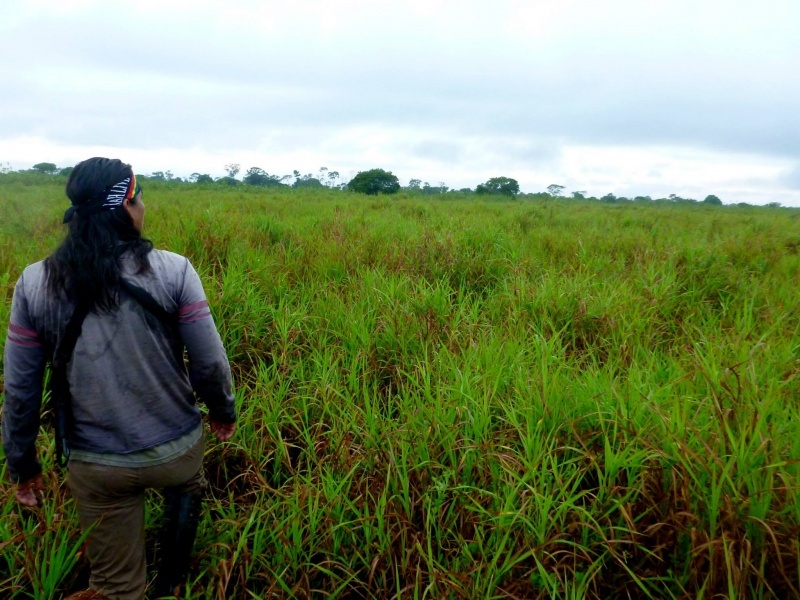 We found 0 anacondas, 3 snails, and 1,000,000 mosquitoes. After lunch we had a nice long siesta in hammocks and then headed out for a piranha fishing trip. 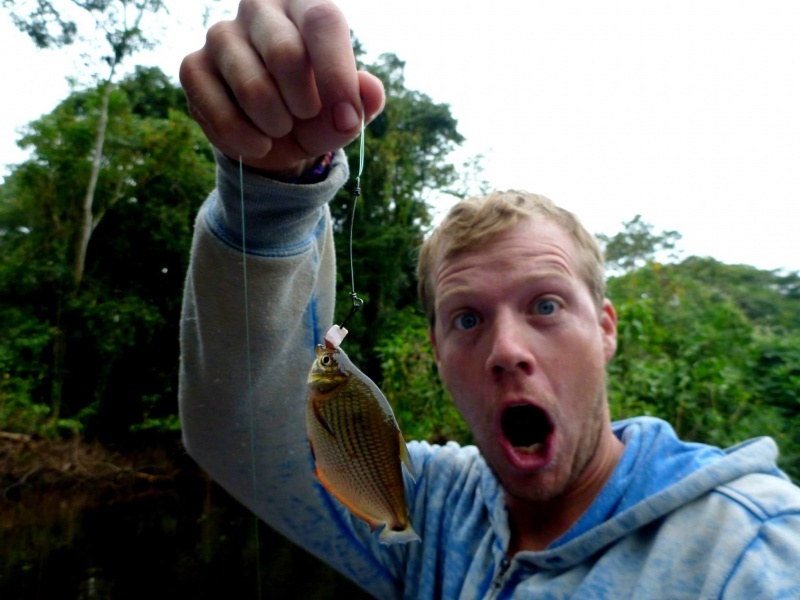 Only our guide managed to catch any piranhas but the rest of us had a good time catching other tiny fish. I caught the most, 3, where’s my trophy? Then we retired to our mosquito net for more weird fun… we planned a tiny speedo synchronized swim for the boys to perform the next day and did a quick finger dress rehearsal then played hunter/bear/ninja to decide who was king. The next day (our last day… tear), after breakfast we went to a “safe” (???) area to swim with pink dolphins. By swim I mean they bit your feet and your bum as they swam by. Funny but painful. One tried to stick my entire foot in his mouth and left me with a tooth mark and a blood blister. The boys performed their teeny tiny speedo synchronized dance routine to the enjoyment of all on the boat and everyone else in the vicinity. On the boat ride back the boys kept the thongs out and added unicorn and horsehead masks to the mix. Some passers-byers loved it, some are likely scarred for life. Moral of the story? Best trip ever. Saw tons of wildlife… moneys, sloths, crocs, turtles, birds, one dead snake, fish, and tons of mozzies; and had a fabulous time being silly with new friends. 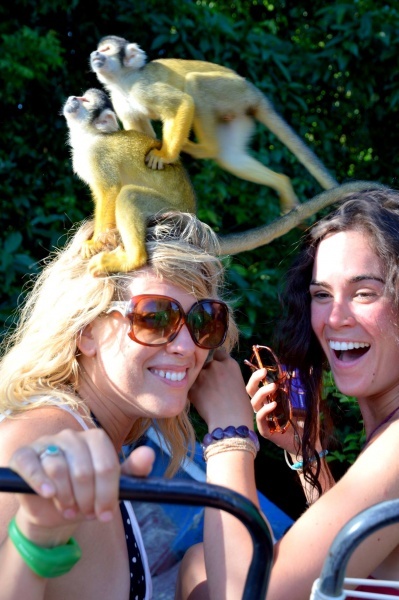 I still maintain the best part was having the cutest monkeys on the planet perched on my head. I can’t help but feel a little sad for Bolivia… they seem to be the landlocked underdogs of South America. Because of that the country seems to be far cheaper than others we visited and food isn’t as fresh and it’s just more difficult for them to get the things they need. That said, the people are absolutely lovely and seem to more concerned with working and caring for their families than hustling unsuspecting tourists. It’s gritty and rough-around-the-edges and awesome and stunning and shocking and in my opinion the absolute BEST country in South America! 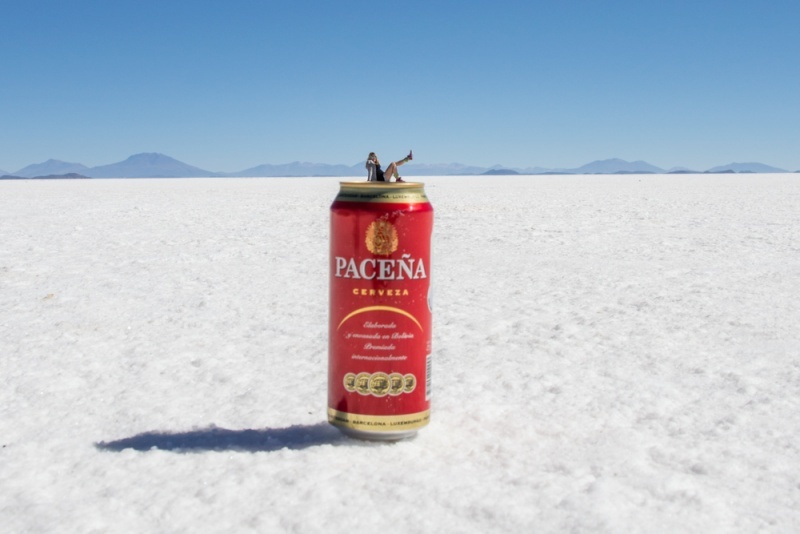 Planning a trip to Bolivia? 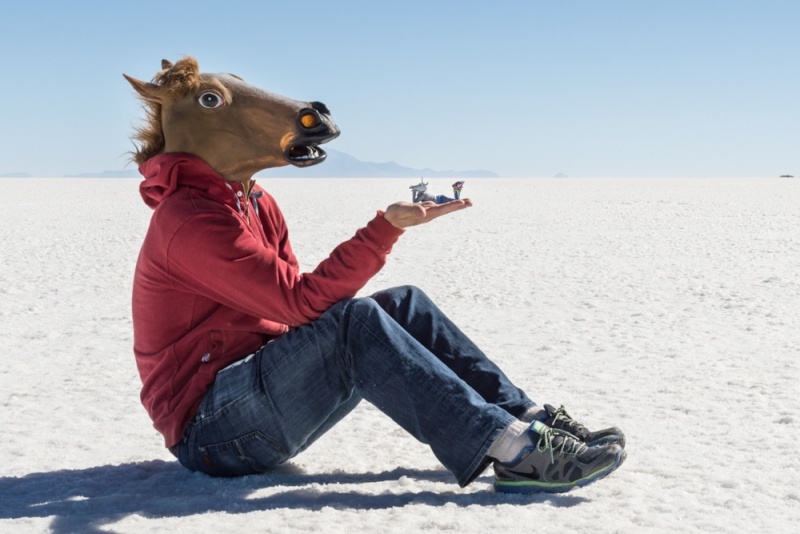 Check out our favorite books and travel guides!